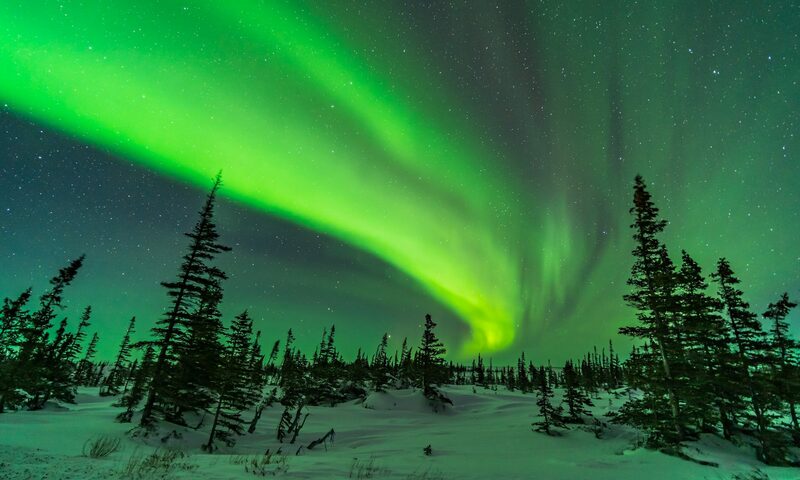 The Northern Lights sweep across the northern horizon in a classic arc of green and magenta curtains. The aurora on the night of July 13/14 never got very bright but the sweep of the auroral oval still made for an interesting panoramic image. I shot this at about 2 a.m. local time, from the high plains of southwest Saskatchewan, right on the Alberta-Saskatchewan border, on the rolling hills of the historic Reesor Ranch. The only man-made light visible is a glow on the horizon just left of the auroral arc, from the city of Medicine Hat, Alberta. The panorama takes in about 180° of sky, framing the sweep of the auroral oval across the northern horizon from northeast to northwest. In fact, you can see the gravel road I was on at far left and far right. The main band of green from glowing oxygen is topped by curtains of magenta, from oxygen and nitrogen atoms. If you could see this display from space you would see it as an oval of light across the top half of North America. From my perspective on Earth, I could see just a portion of the complete oval, as an arc across the northern sky. To create this image I shot 6 segments at 30° spacings, each a 30-second exposure with a 24mm lens at f/2.8 on a Canon 5D MkII at ISO 1600. I used Photoshop to stitch the segments. It blended them seamlessly. I like your wonderful descriptions, too.